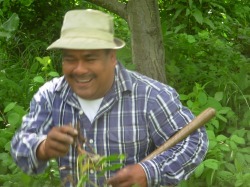 Pablo is our wonderful gardener! He has been working miracles in our soil since 2004. You will find him out in the garden whistling away, while our flock of ducks follow close by. If you listen carefully to the chickens you can hear them saying "Pablo, Pablo, Pablo".